Will next Call of Duty: Ghosts add-on bring John MacTavish into the game? The developers of Call of Duty game series don’t stop delighting us with fresh and exciting news about the last released instalment - Call of Duty: Ghosts. This time we are talking about the upcoming CoD: Ghosts DLC, which will supposedly bring into the game a skin of a well-known and adorable by many gamers character from Call of Duty universe - John “Soap” MacTavish. If you are a real fan of the series, then you know that the abovementioned character is a protagonist in many previous franchise’s parts - Call of Duty 4: Modern Warfare, Call of Duty: Modern Warfare 2 and Call of Duty: Modern Warfare 3. And it seems that now Infinity Ward has decided to bring him back in the next small Call of Duty: Ghosts add-on. Such an assumption can be made judging by the company’s post, which was presented in its Twitter’s account yesterday. 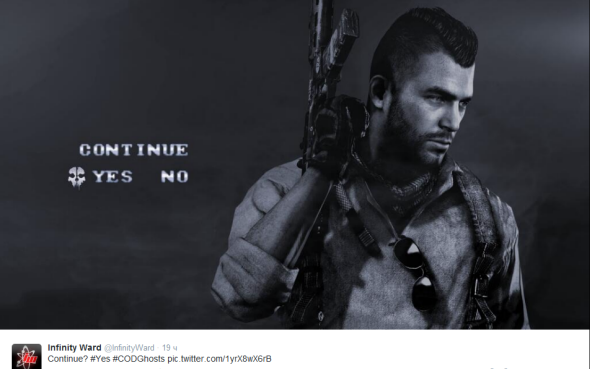 There the developers published a picture of John “Soap” MacTavish with an interesting question on it (Continue?) and two variants of answers (Yes or No). Obviously, in this way the gamers will have to decide whether they want the next CoD: Ghosts DLC to bring John MacTavish into the game or not. And what do you think about it? Would you like to see this character in the upcoming Call of Duty: Ghosts add-on? The answers on the abovementioned questions can be left in the comments below.